Remember the time when a filling meant as big ugly hunk of silver colored metal in your mouth? It was always a bummer to have a filling done because you knew it was going to be big and obvious and annoying. Fortunately, dental technology and procedures have come a long way in the last few decades and now we have the ability to give you invisible fillings! That's right, fillings that no one will notice that also just happen to be better at getting the job done than those old amalgam fillings of your childhood. Tooth colored fillings, also known as composite fillings, are an efficient and nearly invisible way to rid your tooth of decay. We make it in our office, especially for your tooth, using plastic, glass, and a resin that holds it all together. We mix it to match the color of your tooth exactly, it wouldn't do to have a single color of composite filling material because the shades of everyone's teeth vary so much. The old amalgam fillings require a large portion of the tooth to be removed in order to make a successful filling, which results in a lot of healthy tooth having to be removed. This isn't necessary with composite fillings. With composite we are able to drill only the decayed material out of the tooth and leave you with a much healthier and structurally sound tooth. Not only is this composite material great at producing high quality fillings, it is also able to mend teeth that have been damaged in way apart from decay. Dental bonding is a cosmetic dental procedure that we use to repair chipped or cracked teeth that need to be touched up and made to look beautiful again. 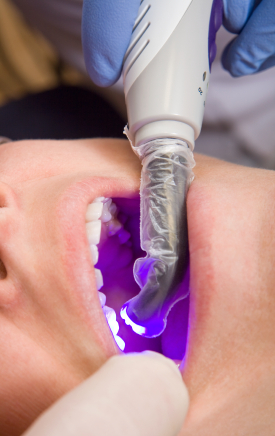 To learn more about composite fillings or dental bonding, call us today at (425) 216-3367 and schedule an appointment.